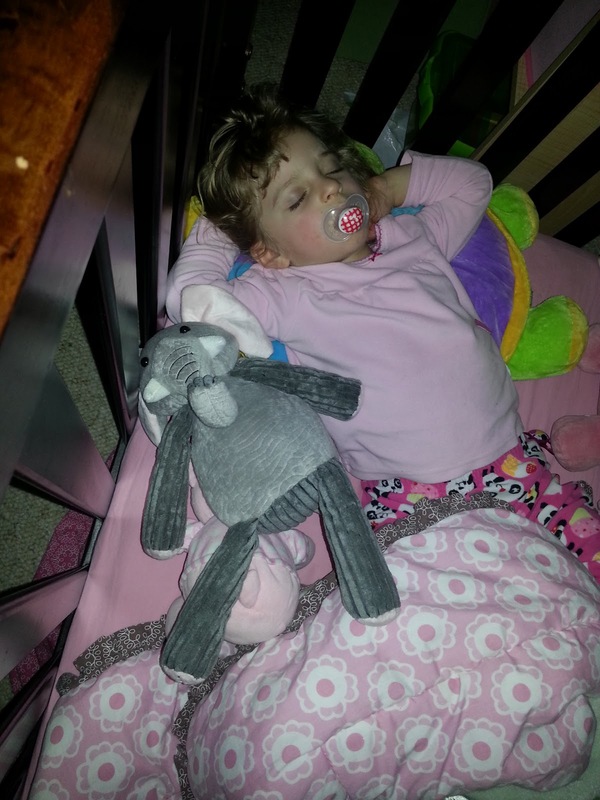 Want to know what's harder than messing with one kid's sleeping habits? Especially when they don't really have the same issues. Neither is waking in the middle of the night, or anything really crazy, but Reagan especially is showing some signs of overtired behavior. You know, where they should be rubbing their eyes and falling asleep, but instead, they take two hours to fall asleep at night, and wake up at the crack of dawn? And are super clingy? Yeah, that. I am a huge proponent of making your kids' sleep habits a top priority. Everyone is happier when everyone is rested. One of the books I read when Madison was a baby compared developing good sleep habits it to making sure they're eating healthy foods. Sure, there are easier alternatives and you'll survive. But eventually it's going to backfire. So from the beginning, with both girls, we had a bedtime routine, I tracked the hours of sleep they were getting, I found the patterns that worked, and we settled into good bedtimes. My girls basically set their own bedtimes - early ones. We followed their lead, and it worked. Easy bedtime, no fighting, happy kids. Early bedtime is awesome. It's great to have some time to collect myself, get things settled, and relax before going to bed myself. In case you haven't figured it out, early bedtime is what allows me to write this blog. But early bedtime can stink sometimes too. When I was working it was very tough. I was picking Madison up at daycare, driving 45 minutes home, and we had an hour to an hour and a half to fit in dinner prep, eating, bath and bed. Then the next morning we'd wake Madison up, dress her, and put her in the car. If you're doing math, that means that during the work week, we saw our daughter awake between 5 and 7 hours - TOTAL. That wasn't ideal. But it was quality over quantity, and our well rested kid was happy. It also can stink in the summer. The sun is still up and shining, it feels like playtime, and you're inside doing baths and brushing teeth. We had to schedule everything around naptime and bedtime. That's why I messed Madison up. I figured with the longer days and no real wake up deadlines, I could push bedtime a little later. 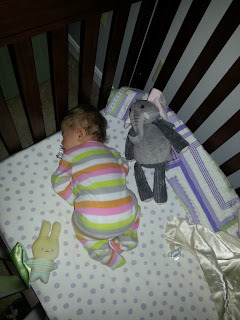 She'd been getting in her crib between 7 and 7:30 and getting up a little before 7. I pushed it to 8:00ish. No big deal...until she started taking almost an hour to fall asleep....oh, and waking up at 6:00. I thought she'd adjust her mornings as she got used to the new routine...I was wrong. And losing those few hours started to add up and make for a very moody, dramatic toddler. Toddlers are moody enough. They don't need help. Reagan kind of messed herself up. She's in nap transition hell right now. If she naps in the morning, she doesn't want an afternoon nap, which makes for an incredibly cranky evening. If she doesn't nap in the morning, she's either a train wreck by lunch, or falls asleep in the car, which means she doesn't nap in the afternoon either. Ideally, during this transition, she needs to nap around 11:00...and we're never home then. So she's overtired, because she's not napping well. And because I'm pushing Madison later, we're eating dinner a little later, and that's pushing Reagan a little later. Instead of falling asleep around 6:30 and waking up twelve hours later, she's going into her crib at 7 and staying awake until 8:30 or later...and is up before 6:00. Combine that with messy naptime...yikes. So cranky. So very cranky. Anyway, after a few weeks of this I told Adam we were doing a bedtime rehab. I did my online research and found out that I basically took exactly what we was ideal and trashed it. Awesome. At least that made going back easier. Madison only needed a little bit of tweaking, but Reagan needed rehab very badly. And when you need it that much, it's not going to be easy. Big breath. Will they fight me? Or will this be exactly what they need? Madison has taken to this beautifully. She is completely fine with her early bedtime, and now she's waking up later. She's in her bed by 7 or 7:30 and is getting up close to 8! She's skipping the occasional nap, but she's happy to rest in her bed with some books. And in the few days we've been doing this, she's already having fewer meltdowns. Reagan....well, not yet. The first day was awesome. Asleep within 10 minutes. Next day, a half hour of "settling" time. The next day, an hour. And napping has been nightmarish. She gets about 20 minutes in the car in the morning, then fights her afternoon nap with all her might. So by bedtime she's overtired. So she's cranky from about 4:30 on, and then she has trouble falling asleep. This evening was exceptionally tough. She was up at 6, and I think she napped about an hour total all day. Madison also didn't nap today, and they just pushed each other's buttons from about 2:30 until I took Reagan upstairs for a bath at 6. By the time they were in bed, I was done. I've not been shy about sharing what we're working on, and I've got some comments from people who think I'm crazy to make anyone's bedtime 6:30. I've had people tell me that if I dump naps entirely, they'll sleep longer at night. I've had people tell me that I need to start staying home in the mornings until Reagan's naps are back under control. I've had people suggest I give them Benadryl to make sure they fall directly to sleep. Here's the thing. You do what works for you. It's like anything else. You take the advice, you read the "experts", you listen to anecdotes, but ultimately, it's your family that you're dealing with. You need to figure out your solution. I'm giving my mini rehab another week with the same new schedule, and then I'll reassess. But if it gives me two happy, non cranky toddlers? It'll be worth it.